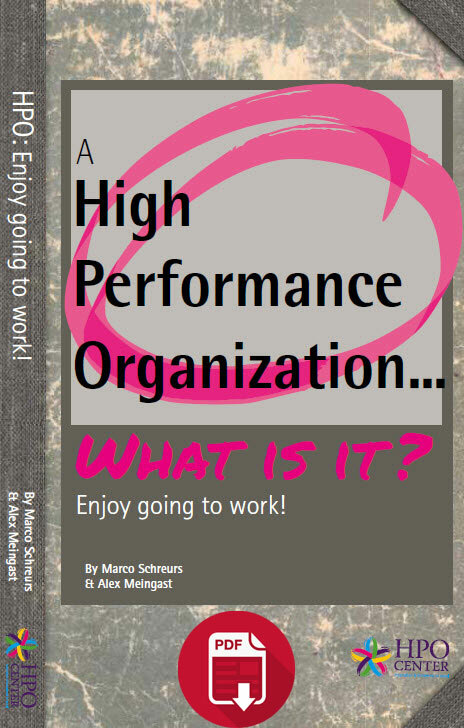 Home » Books » Download for free: A High Performance Organization… What is it? In other words, we want you to work for an inspiring and successful organization; but it is up to you to make it happen! Or buy the real book online at Amazon! Whatever your thoughts are, this booklet has been written with you in mind. Any organization that wants to improve needs every single one of its employees to make a difference and improve through a combined effort, regardless of the department they work in. The HPO Center is helping organizations across the world to achieve this. Your organization may use the term HPO or it is possibly called something else. It is important for you to know that there are 35 aspects in which you and your organization can improve. These will be covered in this booklet. Take your time to read through it all. Decide what you already do well and where you may be able to do even better. Discuss things with your colleagues. Tell your manager which points you think deserve attention. You can allocate a score to every one of the 35 aspects covered in this booklet and then rank them from most to less significant. Then work on the aspects that deserve your attention. Reflect on this once every six months and determine if things really have improved. Compare your scores with your team and also discuss what you can work on together. If you manage to improve any of the less ideal aspects yourself, you are making a difference. If you know what HPO is all about and you try to do your daily work based on HPO principles, other people will increasingly regard you as their role model. Your behavior will inspire them to do the same. Reading through this booklet you will soon realize that improving is not necessarily more time consuming, but that it is just about doing your work differently. You will notice that your work becomes more enjoyable because everything you do together fits and works better. The authors, Alex Meingast and Marco Schreurs, have faced a challenging task. They have combined over a decade of professional research, considerable knowledge and experience in this handy booklet that is easy to read and understand.With this booklet they make an important contribution to providing the expertise of the HPO Center. I am proud of this; well done! I hope that you can use this booklet to improve your understanding of HPO and that you will use the questions in order to develop and improve yourself as well as your team. You might even read something that you can start doing differently straight away. That would really be in line with “HPO”! For more information about HPO or the author Marco Schreurs, click this link.